The Badminton Ontario Club Championships Banner has been re-named to the Badminton Ontario Competition Banner. Points are accumulated by athletes on behalf of their affiliated club for each 1st, 2nd, or 3rd (or Consolation Round Winner) placing team at any Badminton Ontario sanctioned event. Players must have a valid Badminton Ontario Membership to gain points for their club. 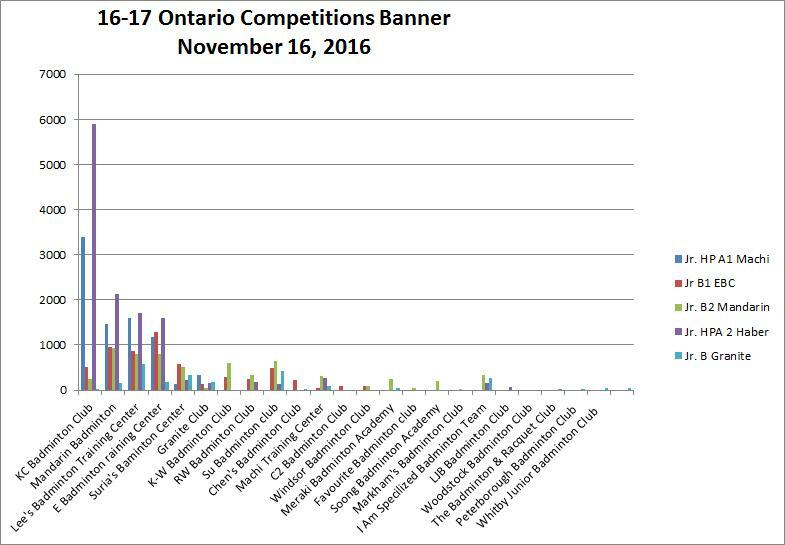 The club with the most points will receive the Ontario Competitions Banner. Badminton Ontario will be moving towards a tiered point allocation system to be more reflective of the level of play. All 16.17 season HP A-Circuit tournaments will be awarded banner points. The 2015- 2016 Club Championship Banner was awarded to KC Badminton Club. The 2014-2015 Club Championship Banner was awarded to E Badminton Training Centre. The 2013-2014 Club Championship Banner was awarded to KC Badminton Club.